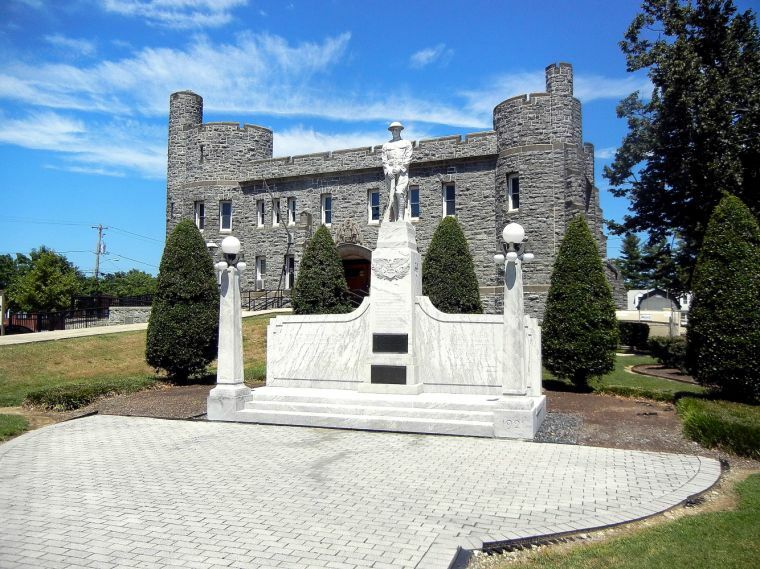 In August 1919, Bergen County purchased land for a monument commemorating the role of Camp Merritt during the Great War at the intersection of Madison Avenue & Knickerbocker Road in Cresskill - marking the center of the largest embarkation camp in the US during WWI. 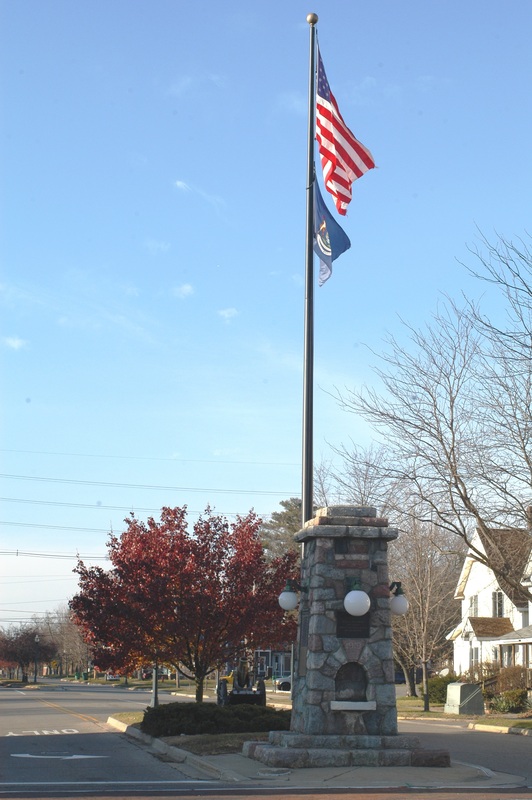 Modeled after the Washington Monument, the obelisk is 65 feet tall and made of granite. 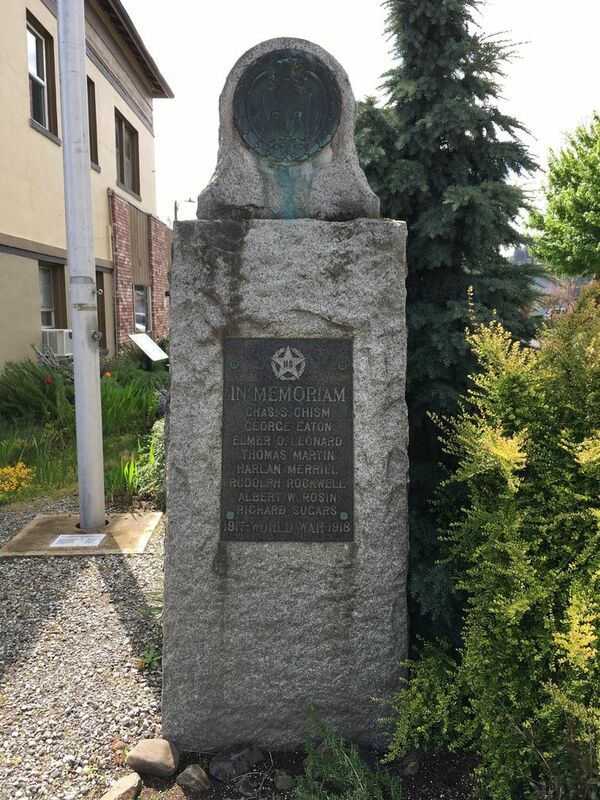 Inscribed on the base are the names of the 578 people who died at the camp, mostly as the result of the 1918 influenza epidemic. A large carved relief by the sculptor Robert Ingersoll Aitken shows a striding doughboy with an eagle flying overhead. Set into a large boulder is a copper plaque with a relief of the Palisades, illustrating that the Camp Merritt site was used as an area of embarkation. The plaque was designed by artist Katherine Lamb Tait. 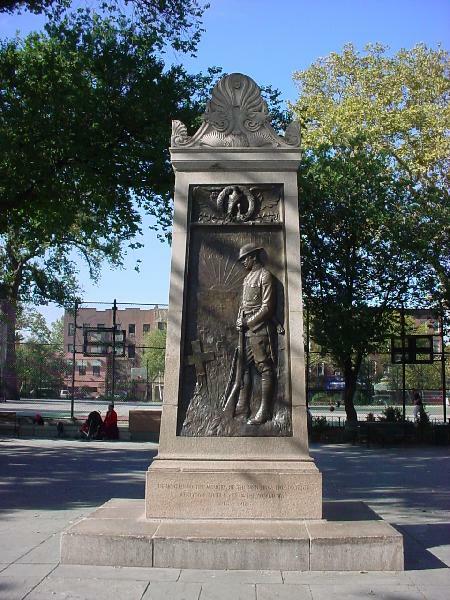 The monument was dedicated on May 30, 1924. A crowd of 20,000 heard a dedicatory address given by famed Army General Pershing. Narrative adapted from Bergen County, NJ official website. Address : 704 E. Military Dr. 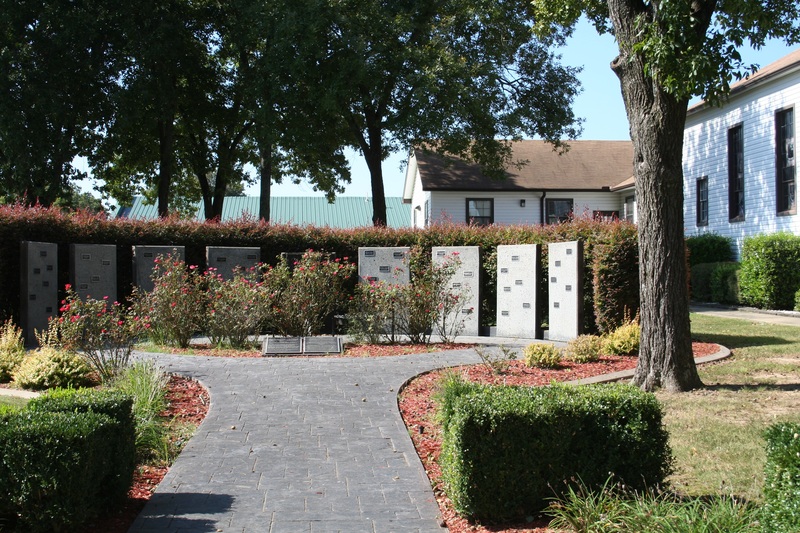 This memorial is located on an active military base at the Camp Robinson Chapel. 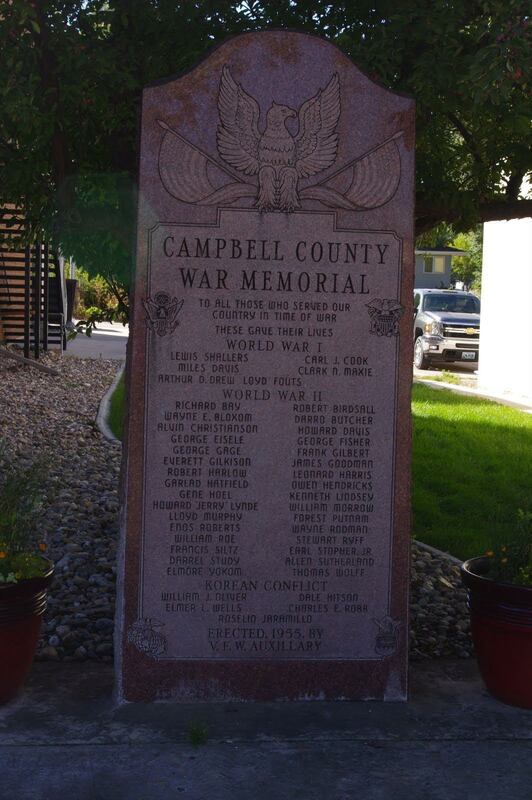 This memorial, the older of the two in Gillette, honors "all who served our country in time of war" and lists the names of those from Campbell County who gave their lives in World War 1, World War 2, and the Korean Conflict. It is located outside the courthouse. 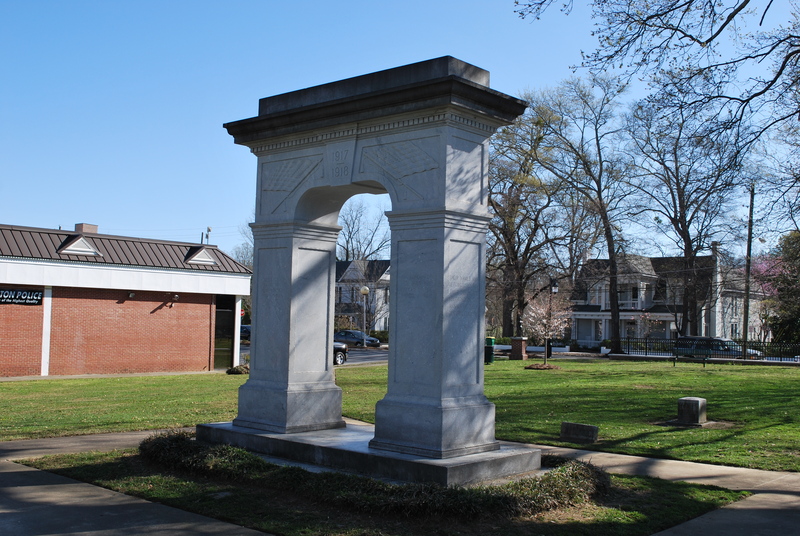 Description : The large arch monument is in the center of Brown Park. 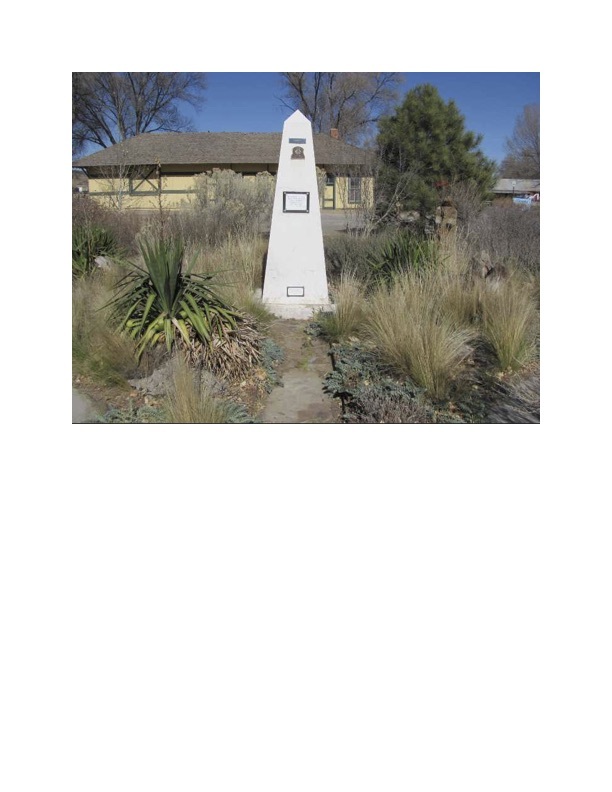 A concrete obelisk, painted white, was erected here in about 1945. 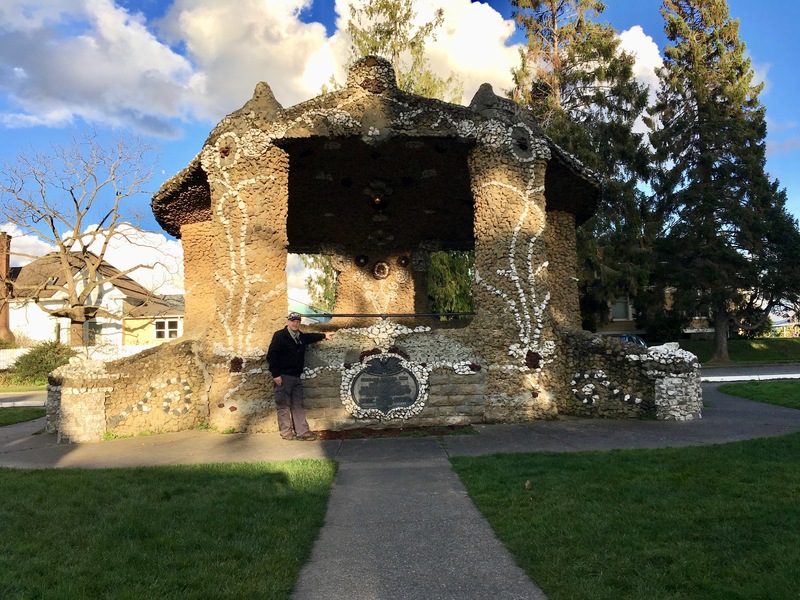 It originally had a bronze plaque listing the names of Lincoln County residents who were killed or lost in WWI and WWII. 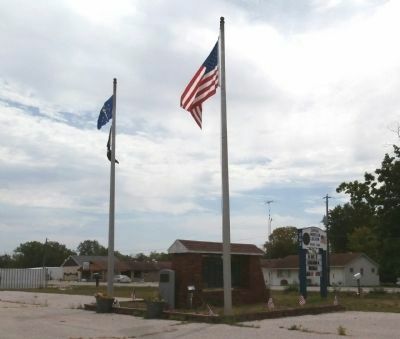 The plaque was stolen and replaced by another in about 1990 which hon­ors veterans of all wars. 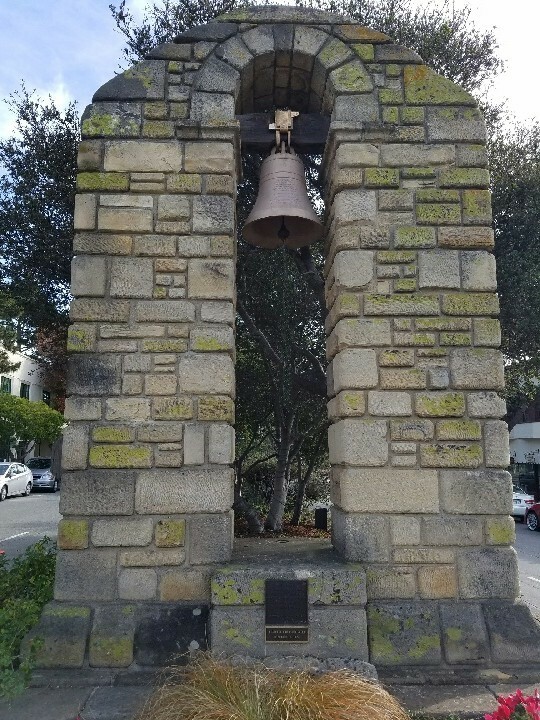 "In honor of those who served / In memory of those who died / We dedicate this Centennial Bell / October 31, 1916...October 31, 2016 / American Legion Post 512 / The people and City of Carmel-by-the-Sea." For 44 years the memorial arch lay empty, as there were not enough funds to construct a bell. 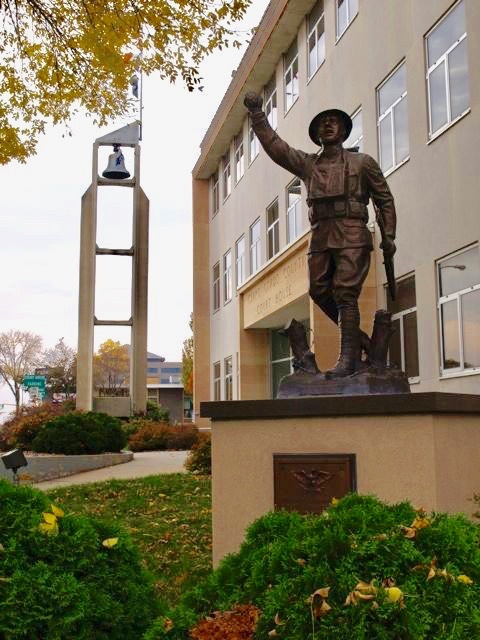 A donated bell thought to date back to 1692 was added to the memorial in 1966, where it stood until it was replaced by a new bell on Veterans Day 2016. The old bell is now stored at the library's Local History Room. “Nov. 29, 1933 - Charlie Rabun Chapter No. 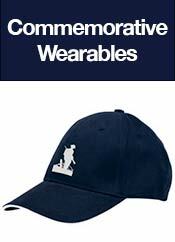 14 - D.A.V of W.W. - In Memory of Our Deceased Comrades”. “A Message to Future Generations.” Inscribed with thirteen names. Side 1: They faced the perils of the sea and the hidden foe beneath the waves. Side 2: They sought no glory but their country's good. Two Honor Rolls entitled: Died in the service of their country. 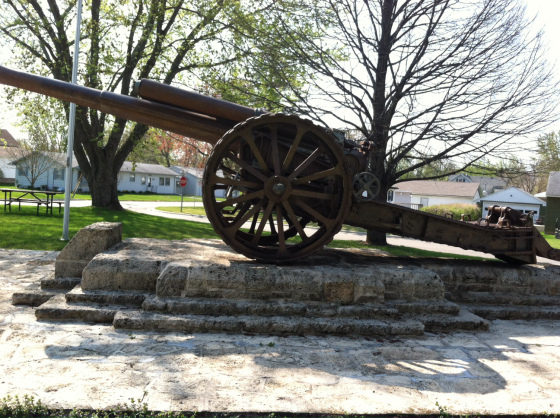 This monument dating from 1919 has a memorial plaque for Cass County residents, and one for Dowagiac City residents. It sets at the start of Main Street right across from the front of City Hall. Korean War and the Vietnam War. 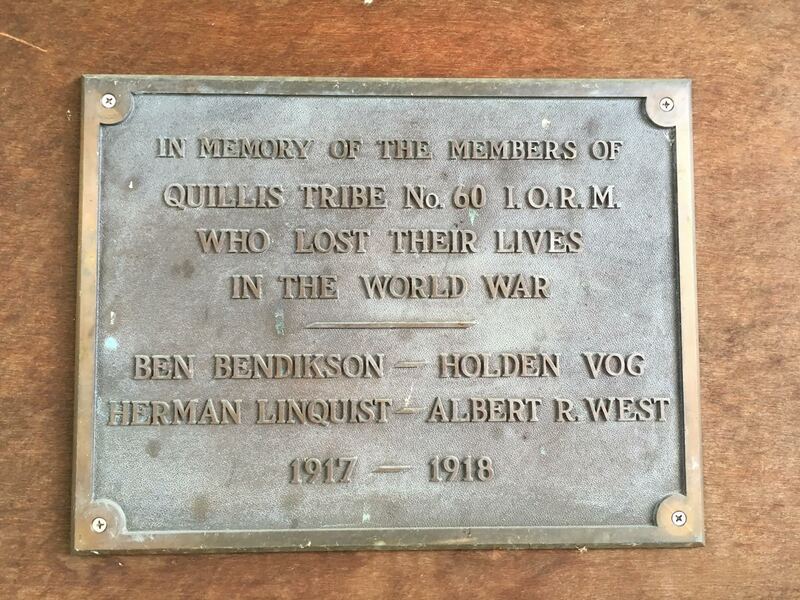 This bronze plaque is dedicated to the fallen members of the Quillis tribe, a local chapter of the Improved Order of Red Men fraternal organization. 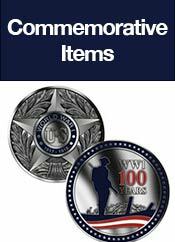 It is located in a cemetery shelter at Greenwood Cemetery, next to a similar plaque honoring WWII servicemembers. Address : 7863 Nashville St. 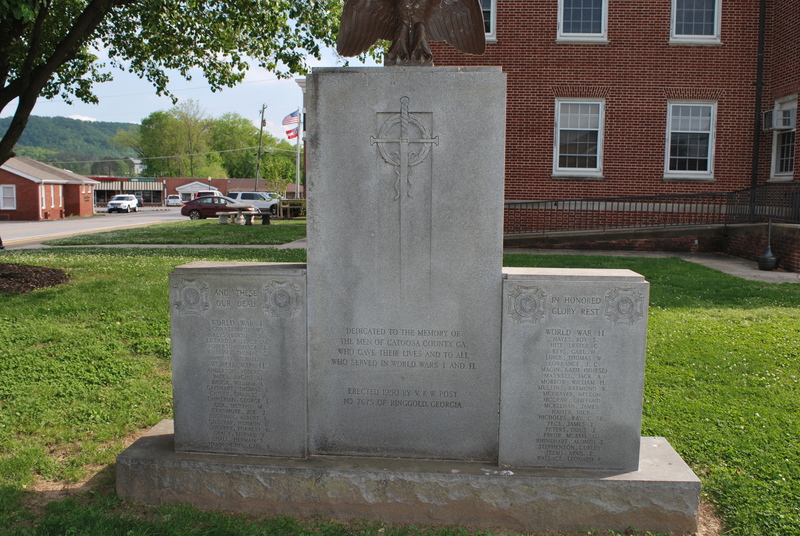 This memorial contains the names of six soldiers from Catoosa County who died in WW1. The backside of this memorial is dedicated to those that served in subsequent wars. Named in honor of Harry Leon Causland, Private, Company I, 357th Infantry Regiment, 90th Infantry DivisionNamed in honor of Harry Leon Causland, Private, Company I, 357th Infantry Regiment, 90th Infantry Division“Killed In Action” in 1918, at the Battle of Bantheville Hill, Meuse-Argonne Offensive, France while volunteering to carry ammunition to his comrades. Honored as one of General John J. “Blackjack” Pershing’s “One Hundred Mortals“, he was posthumously awarded America’s second highest medal for valor, The Distinguished Service Cross. 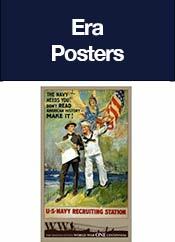 Address : 101 Railroad Ave.
A standing figure of a soldier dressed in his khakis and wearing his helmet. He holds a rifle in front of him with both hands. 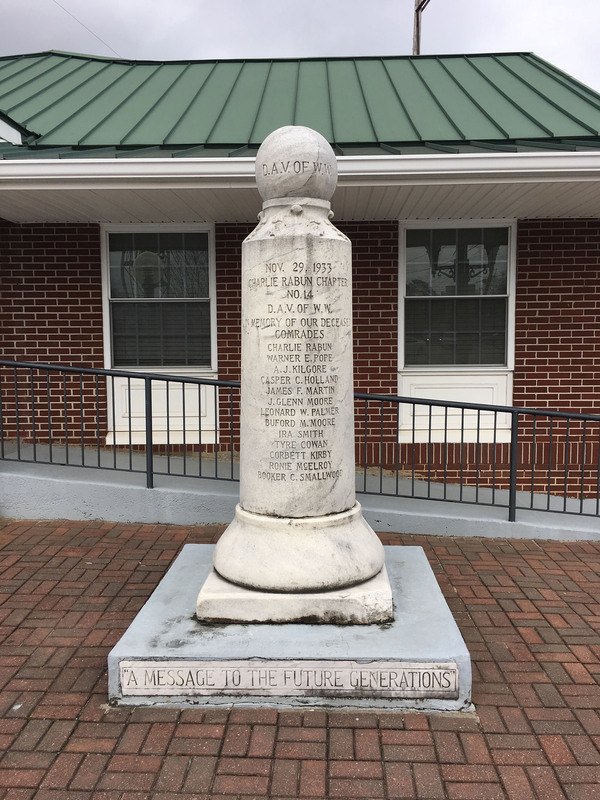 The base of the sculpture is a shaft flanked by large paneled slabs inscribed with the names of Cecil County men who died in World War I. At the bottom of the base is a row of three steps. At each end of the base, on the front corners, are tapered shafts topped by electric lamps. On the front of the base is a carved eagle. 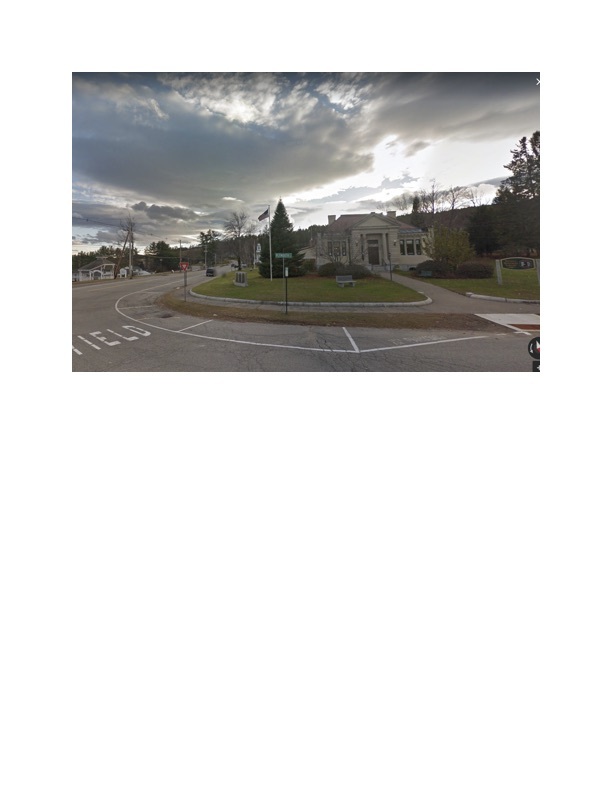 Address : Nichols Memorial Library, Plymouth and Main Sts. and Meredith Rd. 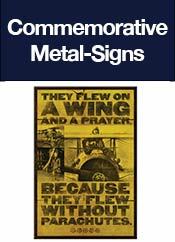 On a granite stele are three bronze plaques, a WWI artillery battery in action, emblems of three branches of the U.S. Armed Forces, and the military badges of the Army, Coast Guard, Air Force, Marine Corps, and Navy. 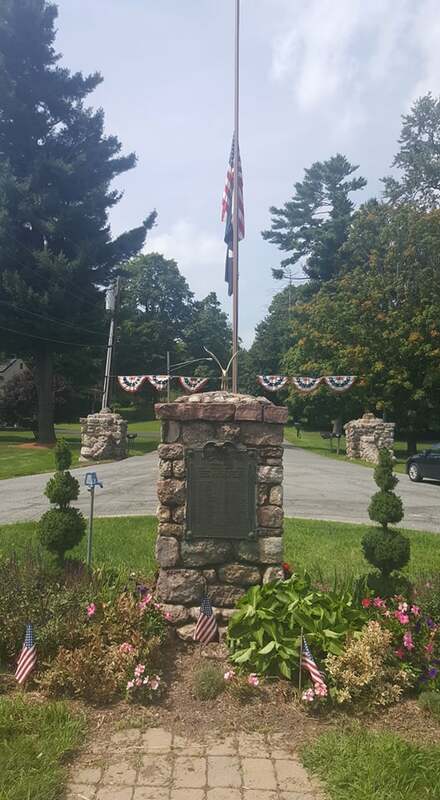 It was originally installed in about 1920 to honor the Center Harbor citizens who fought in the Civil War, the Spanish-American War, and WWI. It was expanded after WWII to include its veterans. 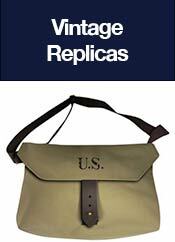 In 1992, it was expanded again to honor the vet­erans of the Korean, Vietnam, and Persian Gulf Wars. 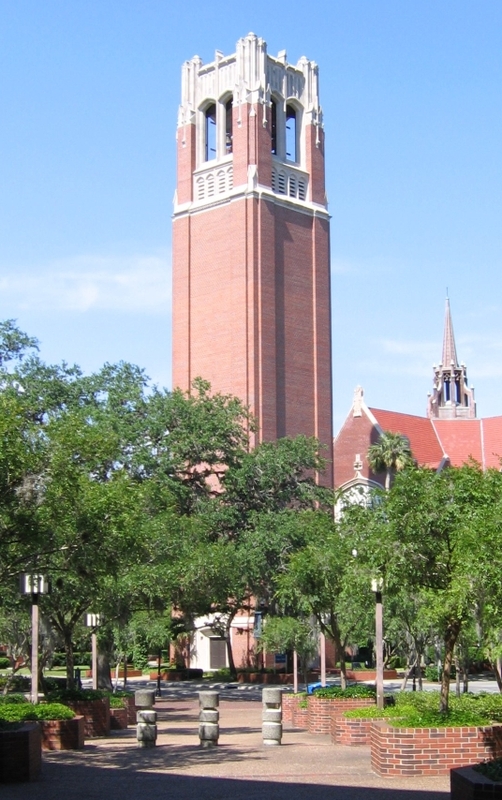 "Dedicated to the Residents of Central Valley who Gave Their Services to the the Cause of Humanity"
Century Tower is one of the most identifiable features of the University of Florida campus. The dream of building a tower began in 1953, when alumni sought funds to construct a monument in memory of students killed in World War I and World War II. The tower also commemorates the 100th anniversary of the founding of the University of Florida in 1853. The fund drive resulted in the construction of the 157-foot-tall tower, completed in 1956. Address : 4411 Prospect St.
"Charles Young was the third black graduate of the United States Military Academy, class of 1889. Young enjoyed a diverse military career as a lieutenant of a cavalry troop squadron, and regimental commander, acting superintendent of a national park, military attaché to Haiti and Liberia, professor at Wilberforce University and military advisor to the President of Liberia. 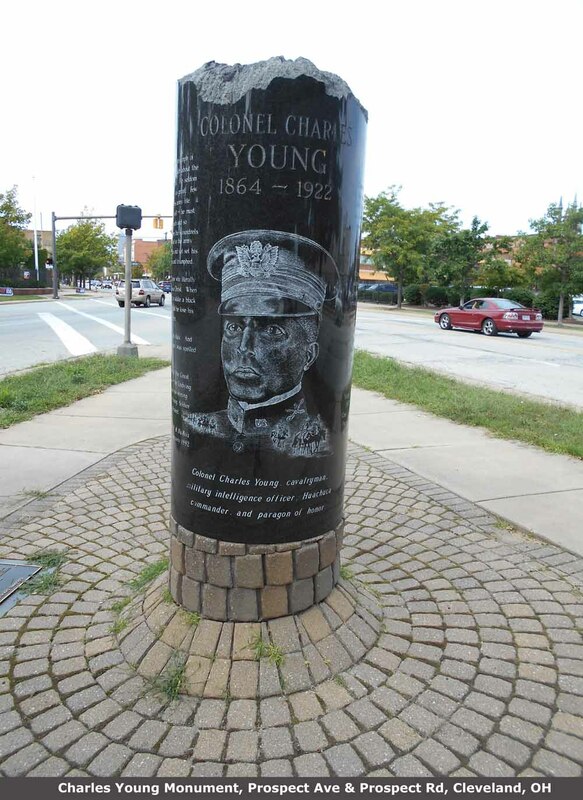 Colonel Young was a dedicated soldier and statesman. Young is an American legend, a model for youth and adults of all races to emulate. As a 'Buffalo Soldier' he was present on the early westward frontier. At Fort Huachuca, Major Young commanded the 2nd squadron cavalry regiment in the Punitive Expedition against Pancho Villa in Mexico, served in the Spanish American War, and the Philippine Insurrection. On June 22, 1917 Charles Young became the first African American to reach the rank of Colonel. "The life of Charles Young was a triumph of tragedy. No one ever knew the truth about the Hell he went through at West Point. He seldom even mentioned it. The pain was too great. Few knew what faced him always in his army life. It was not enough for him to do well - he must always do better: and so much and so conspicuously better as to disarm the scoundrels that ever trailed him. He lived in the army surrounded by insult and intrigue and yet set his teeth and kept his soul serene and triumphed. He was one of the few men I know who literally turned the other cheek with Jesus Christ. When officers of inferior rank refused to salute a black man, he saluted them. Seldom did he lose his temper, seldom complain. Steadily, unswervingly he did his duty. And Duty to him as to few modern men, was spelled in capitals. 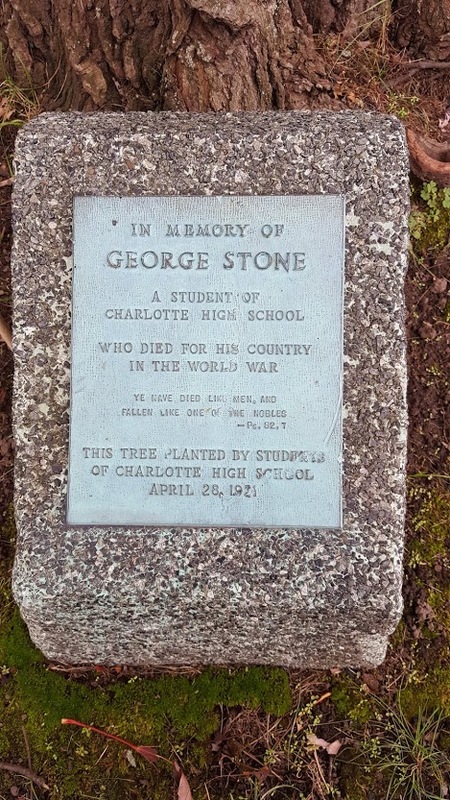 Memorial trees with six existent commemorative plaques for graduates of Charlotte High School, currently located in Rochester, New York, who died in service in the war. 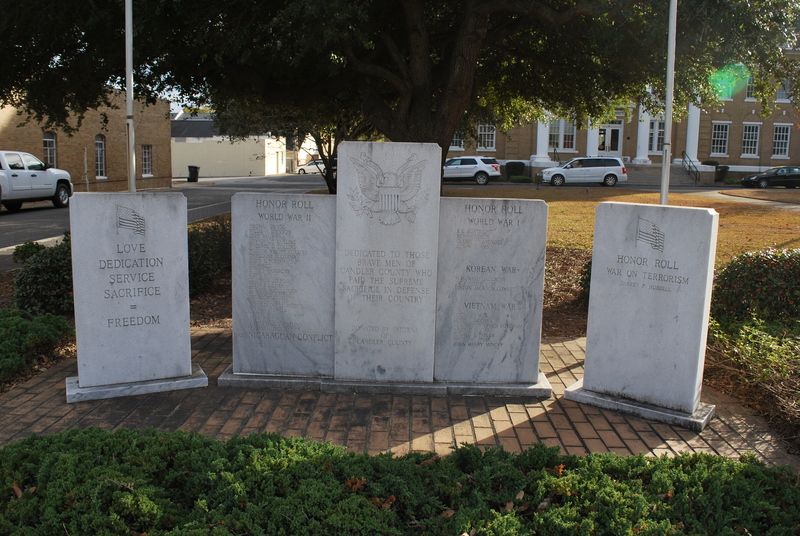 Memorials created by CHS Class of 1921. They are located along former lane on east side of carousel.